Be a film tycoon. Buy film stars, directors, locations, stories. Will your film win an Oscar or become a worthless flop at the box office? 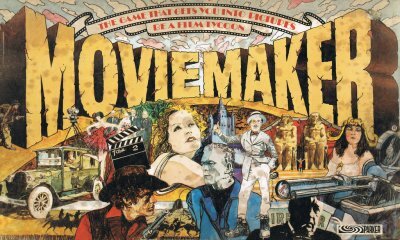 The Moviemaker board game was published by Parker in the 1970's (no date is given, but I'd say mid to late 70's). The object of the game is to make successful films and make as much money as you can through the box office. To make a film you need a film story, a director, a male film star, a female film star and the relevant number of location units. These are bought and traded as you move around the board. The game is rather similar to Monoply, with the player having the greatest total assets and cash being declared the winner.